Our God's Way Personalized Sweatshirts are available on our premium white cotton/poly blend Customizable Sweatshirts, machine washable in adult sizes M-3XL. Also available in Pink. Includes FREE Personalization! 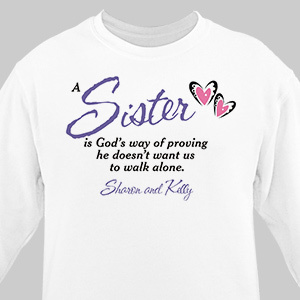 Personalize your God's Way Personalized Sweatshirt with any title (ie: Sisters) and up to 6 names. I am very pleased with the gifts I ordered. They are great. I was impressed with how fast they were received. It was a gift for my sister and she has not received it yet. There was a blizzard in New York and the mail has not been delivered in quite a few days. I'm sure she will love it because I purchased products before and they were very good and very diferent.